During the secondary research portion of our four-phase exploration of the lives of The New Independents (the 50.2% of U.S. adults who are single), one of the articles that caught our attention was a piece in The Atlantic titled "The High Price of Being Single in America." The gist of the article was that, "over a lifetime, unmarried [people] can pay as much as a million dollars more than their married counterparts for healthcare, taxes, and more." This article attempted to empirically demonstrate that singles pay more income tax, collect less in social security, and contribute lower amounts to retirement savings plans. They are also required to spend a greater proportion of their income on healthcare and housing. When we started this deep-dive into the lives of The New Independents, we, along with our partners at TPN, presumed that singles not only had more freedom to spend their money but, overall, were in a better financial situation than married people. This was the first of many myths about The New Independents that we invalidated. It turns out that singles tend to be in a more precarious financial situation than married people. That's the finding. What's the why? Well, you'd think that would be easy to answer right? Just look at the way the single lifestyle is portrayed in pop culture - the 30-something who you never see working, but always see spending. It turns out the way singles actually think about and spend money is quite different from these fictitious portrayals - so what's the real why? HENRY is an acronym coined in a 2003 Fortune magazine article to refer to a segment of the population composed of High Earners, Not Rich Yet. These are people with above-average incomes, but low (if not negative) net worth. While not synonymous with singles, our research revealed a high degree of overlap between HENRYs and The New Independents. Let's start by looking at income. 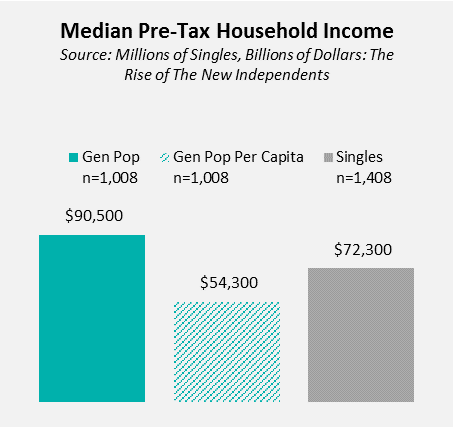 The median income for general population (gen pop) households was $90,500, while the median among singles was $72,300. But, consider that a majority of gen pop households include two earners (upwards of 60% according to Pew). Households of one do not, so on per capita basis The New Independents are actually earning more - significantly more - than married people. This higher per capita income, however, does not necessarily translate to a positive net worth. 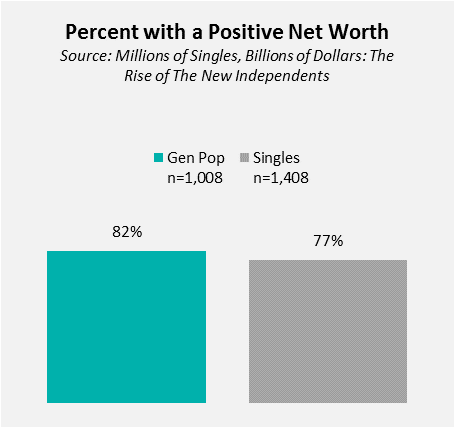 Indeed, gen pop households were significantly more likely than singles to report a positive net worth. How can this be? The stereotypical portrayal of singles would lead one to believe they are simple spending a greater share of their income thus saving and investing less. But is that true? While singles are certainly spending more on entertainment and leisure, health and wellness, and dining out, overall they tend to spend a lower share of their income compared to married people. This is in large part due to the absence of child-related expenses. The result? Singles, on average, are saving and investing more than married people. If singles are earning more, spending less, saving and investing more, and are more quickly eliminating debt, then why is it they are significantly less likely to have a positive net worth? Perhaps the answer lies in a slew of regulations which, while not explicitly discriminatory, are rigged to encourage and reward a coupled lifestyle. U.S. Federal Code Title 5 Part III establishes that, "the President may prescribe rules which shall prohibit...discrimination because of marital status." But, as Arnold and Campbell point out, "more than 1,000 laws provide overt legal or financial benefits to married couples." When marketers think of singles, we tend to have an anecdotal picture of people with virtually unlimited freedom to spend their money however they wish. And that is partly true; singles are significantly more likely than married people to agree that they have the freedom to do whatever they want with their money (38% vs. 27% gen pop). But, as we have seen, that doesn't mean singles are conspicuous consumers. Develop proxies for singles to realize their innate desire to nurture. After all, "the decision not to procreate doesn't signal a switch from nurturers to narcissists." Brands which can evoke feelings of mentorship (Starbucks subsidizing college tuition for employees), philanthropy (TOMS one for one), or environmental stewardship (Saltwater Brewery's edible six-pack rings) may have an advantage. And, don't forget pet care which is now a $50B+ industry...and growing. Download our special report, Millions of Singles. Billions of Dollars. The Rise of the New Independents, to learn more on how you can capitalize on the growing market of The New Independents.